it’s time once again to harvest the peaches and enjoy The Transformative Power of A Real Peach ( and a little heavy whipping cream ). 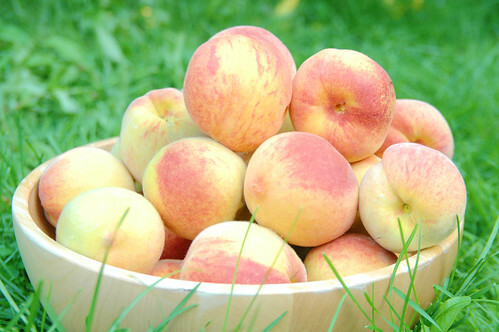 if you’re able to get the chance you should experience a peach fresh off a tree. amazing. we’ve pulled maybe 4 dozen peaches off the tree in the past week and there’s at least as many yet to be picked and that’s with plenty of evidence laying around that the squirrels are taking quite a few. there’s such a bounty that we don’t even have to resort to balloon peach decoys! i see some grilled peaches with balsamic vinegar and caramelized brown sugar in my future. Previous Postday 3331: tooling around in the galaxie, hanging out at a napa store.Next Postday 3335: odin helps with his first “big” repair on the galaxie 500! Pingback: snowdeal.org - recipe: peaches and cream ice cream!